Welcome to Change The World Wednesday (#CTWW)! Wondering how to live greener? You've come to the right place. Each week we challenge ourselves to try a new task ... or "amp up" something we're already doing. We raise our awareness, learn from each other and develop Eco-friendly skills which will improve our lives and protect our planet. Doing so together gives us power ... the power to Change The World! If this is your first visit, please click HERE for information and a complete list of all the challenges we've taken on so far. For the past two weeks, we've been eliminating plastic bags from our lives. I found that avoiding them isn't as easy as it sounds. In some stores, items are placed into a plastic bag before one has a chance to tell the cashier "no". The interesting part about that is when the cashier learns that we don't want plastic, items are removed from the bag and then, the bag is tossed into the trash bin. Yep, you heard that right! I've gotten in the habit of telling them, before they even flip the switch on the conveyor belt, that we have our own bags. The trick is to tell them before they touch a single item. On a side note, "Art" and I have moved out of our apartment and now live on our beautiful, forested property. We are thrilled to be homeowners. The Honor Society are those people who help us spread the "green" word by writing an article about our challenges and/or leaving pertinent comments. Argentum Vulgaris (AV) wasn't able to ban the bag from his life but he did use the challenge as a means of raising awareness in Brazil. In Change the World Wednesday – 16th Jul he shares his one-man education system. During week #2 of the challenge, AV's cell phone died. Since most everything comes wrapped in plastic (and is made of plastic), he went on a search for a new phone without plastic. How did he do? Find out in Change the World Wednesday – 23rd Jul. 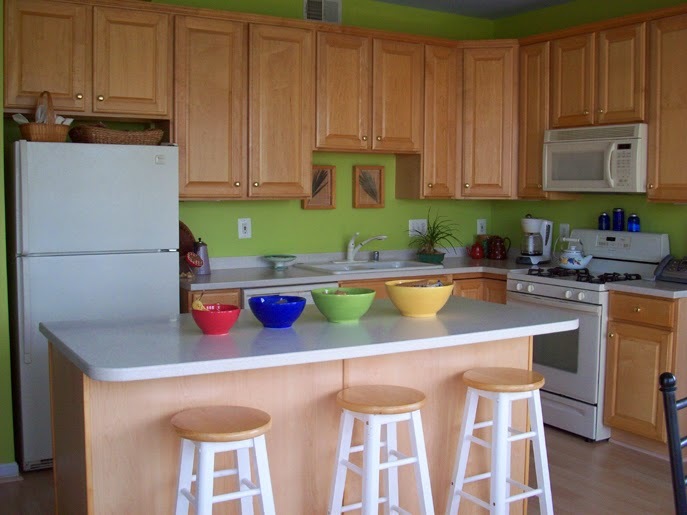 A few challenges back, we greened up our kitchens. My bloggy friend, Robert, wrote a terrific article on this very topic: How To Make Your Kitchen More Eco-Friendly. Check it out! Alicia joined us and shared this: "We use reusable bags and love them. I have made almost all of the bags we use by recycling tee shirts and other fabrics.We don't buy many products that come in plastic but I have to admit that I am still buying our organic spring mix in plastic containers. I can buy it loose at places like Whole Foods but there is not one really close to us.Our regular grocery stores and places like Sam's Club all carry it in either plastic bags or those thick plastic containers. Since the Farmers Markets are open now I can find it at some of them. We plan on planting a Fall crop of the Spring mix varieties. I think I may look for some smaller produce markets that might sell things like this that are not prepackaged or just wait and only buy it when I am in the area where there is a Whole Foods." In Change the World Wednesday, Plastic, Lois shares a conversation she recently overheard at the checkout stand. It was interesting ... and sad. She goes on to talk about her plastic-free July and how that's been working out. She's still searching for appropriate freezer containers. A good alternative to plastic turned out to be coated in plastic. Ugh! Mary stopped by and left this comment: "Crazy stats! This is always a good idea because it's easy to switch to reusable bags. Many stores make them very affordable and sometimes even give you discounts for bringing your bags. They're useful beyond carrying groceries too for many purposes!" This edition of The #Green Daily included my retweet of one of your tweets. Was it yours? Vicki accepted our challenge on greening the kitchen. Here are her comments: "... This is a great challenge - I need to remember to put away the laundry on time so I always have dishtowels and washcloths available and dont resort to paper towels!" Katie's comment shows just how hard it is to avoid plastic when preparing a meal: "I went to the grocery yesterday to buy ingredients for a meal I am making for a family that was in a car accident. Between the salad, the main dish ingredients and the fruit for dessert, I think I ended up with at least 5 plastic containers. Yes, they can all be recycled, but still! That is a lot of waste. I don't even know how you can get things like ricotta cheese not in a plastic container. Maybe I can find a local dairy farm. :) "
Lisa wrote a fabulous post, entitled The Sustainability R’s: Reduce, Reuse, Recycle and More. In it, she talks about 6 R's and then goes on to list all the R's she's found on various sites. The result is a much more holistic view of living green. One of the R's directly affects our "ban plastic bag" challenge ... can you guess which one it is? Please note: I was offline for the majority of the last two weeks so I was only able to gather a few tweets. I apologize if I missed anyone's contribution! 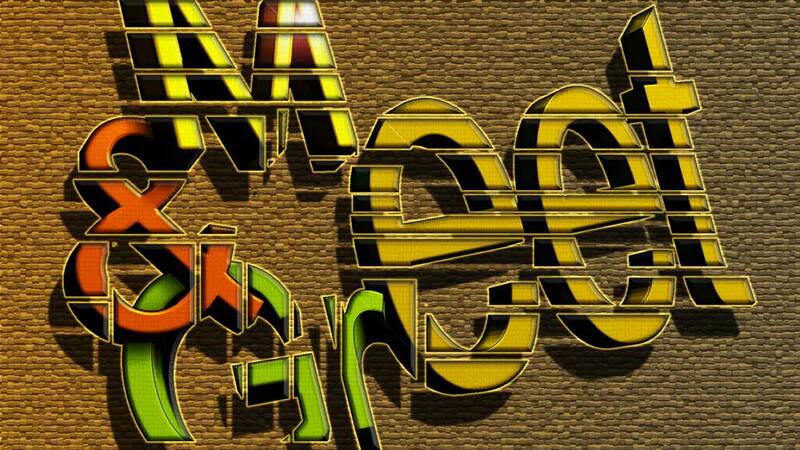 As I mentioned above, I have been offline, so there won't be a list of gang members this week. We'll be back to normal next week! Thanks for your patience! Plastic bags seem innocent enough. They are useful and can be recycled. So what's the problem? Here's the thing, the majority of bags are not recycled. That means that most of them end up in landfills. Plastics do not biodegrade. They photodegrade. That means that they break down into smaller and smaller fragments of plastic. These small bits and pieces soak up toxins. They then contaminate the soil and waterways. Considering their impact on the earth and all life, they are anything but innocent! Thanks, everyone! If you wrote an article, I Stumbled, Tweeted, Facebooked and posted it on Google +. You can help spread the "green" word by using the share features located below this post. Did you know that rechargeable batteries can reduce your carbon footprint by up to 1,000 pounds over the life of the batteries? Here's another fact: most single-use batteries are tossed into the trash bin and end up in a landfill where they leach out toxins. 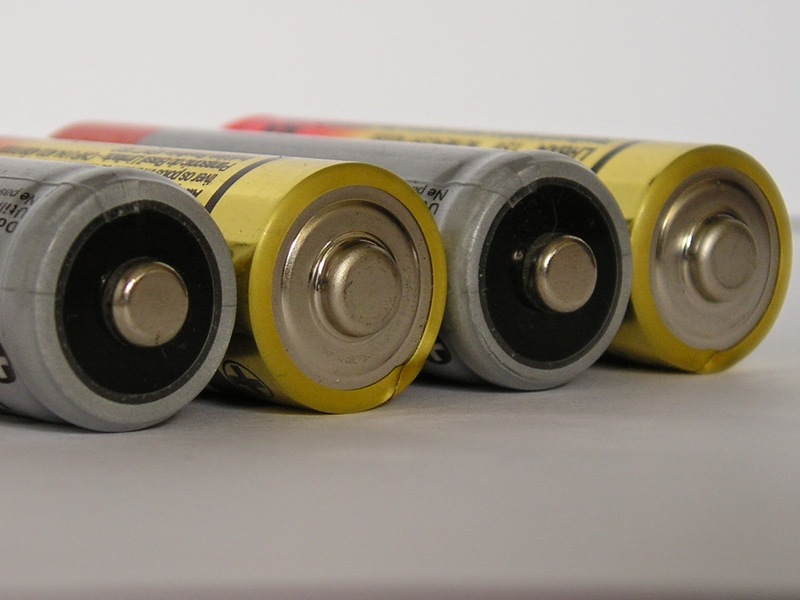 If you are not using rechargeable batteries, please make plans to buy them when you next need batteries. As you replace single-use versions, be sure to recycle them rather than toss them into the trash bin. If you have already made the switch to rechargeable batteries, please find one single-use item in your home and replace it with a reusable version. If you've banned single-use items from your life, please share one of your favorite "upgrades" to reusable. Are you up for this challenge? I know that you are! This post will introduce you to the companies listed on our Special Offers Page. I am receiving no compensation for this post ... I simply want to introduce you to companies doing their best to operate in an earth-friendly manner. Every few months, I like to take the opportunity to feature vendors who are making a difference in our world. They embrace environmental sustainability and make protecting the earth the main focus of their business model. Micah Toll takes green transportation seriously. He discovered just how easy, and inexpensive, it is to build an ebike. Ebikes are perfect for those times when pedalling isn't enough power and a car is too much. 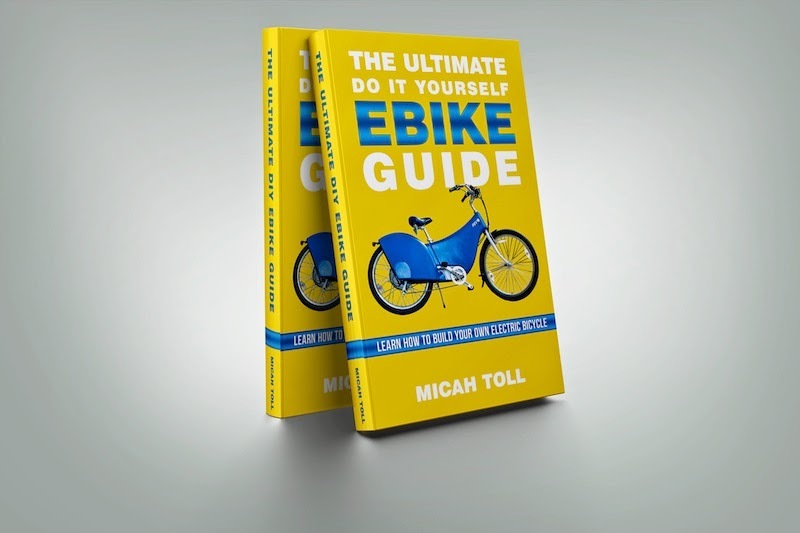 "The Ultimate DIY Ebike Guide (an ebook)" offers readers everything they need to know to turn their bicycle into an efficient, Eco-friendly mode of transportation. Reduce Footprints readers can pick up their copy at a discount of 15% off the list price. Essential oils are ... well ... essential in a "green" home. Some oils act as a natural disinfectant, perfect for removing mold and mildew. Others can be used in place of commercial air fresheners. They can enhance our moods and even repel bugs. 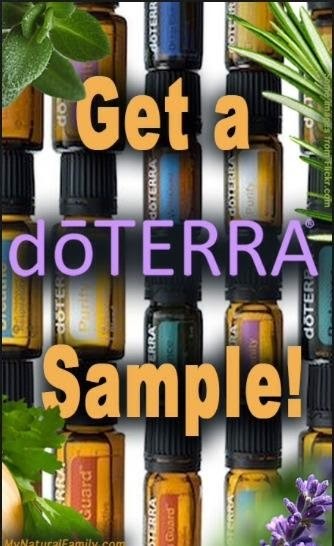 doTERRA is giving readers a free sample. Sometimes we may not "need" an item but it serves to make us happy. And happiness is important! Eco-friendly accessories for a little girl's hair can bring a smile to her face. Pretty "green" items for a home can help us feel content. And what woman doesn't feel a bit special when wearing a beautiful headband. The folks at Violet's Buds are offering us 20% off any purchase from their shop. Environmentally sound products can be both beautiful and functional. 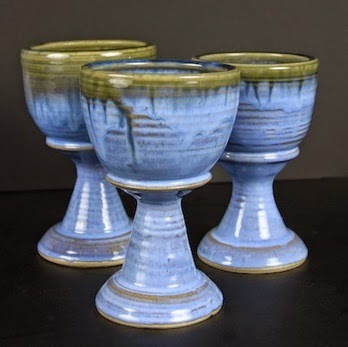 Paloma Pottery uses recycled glass to create items such as goblets, bowls, home furnishings, jewelry, and more. For a limited time, you can get 15% off your entire order. Vacations add vitality to our lives. More and more vacation spots are going "green". La Francesca resort is one such spot. 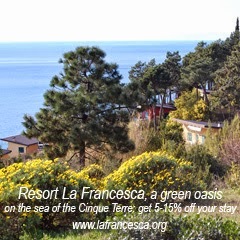 Located along Ligurian Eastern Riviera, in a 15 hectares' protected area, La Francesca is a self-sufficient settlement. Eco-friendly accommodations offer visitors a chance to discover landscapes, scents and natural flavors. Reduce Footprints readers can get a discount of 5% to 15% off their stay in this unique resort. Using recycled products, natural dyes, and earth-safe materials is important. What if your purchase could not only protect the earth but protect the people who create the products as well? 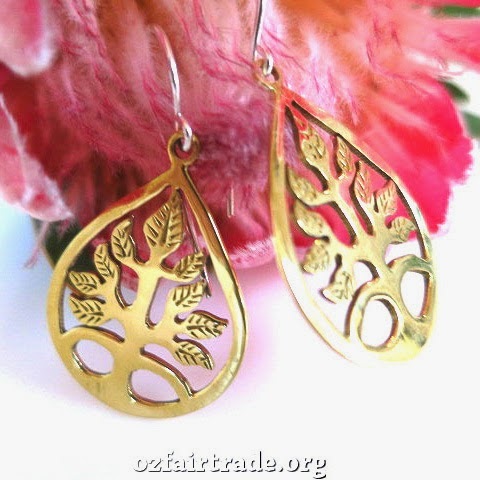 Oz Fair Trade Pty Ltd has a simple goal: to help artisans, living in extreme poverty, by providing a platform for their beautiful products. Get 15% off their Eco-Friendly product range. The most Eco-friendly purchase is, of course, no purchase. But when we do buy a product, we have a great opportunity to support "green". There is power in our purchases. When you choose to buy, I encourage you to support vendors who care about the earth. And, of course, check out our Special Offers Page for exclusive deals. If you have an Eco-friendly product and would like a free listing on our Special Offers Page, please contact us at reducefootprints at gmail dot com. Are there exceptions to green living? When dealing with hospitals, which is what we do all to frequently,We are given plastic plates covered in cling film with plastic cups etc but we are not allowed to take in food and drink from home. Also all the medical gear and cloths are disposable. All tablets come in blister packs , in the EEC this or disposable weekly trays are all that are allowed. Also unfortunately we can not afford organic food but we try to grow as much as we can. there are certain convenience items, like feminine products, that I refuse to give up. I try to make up for it by reducing my carbon footprint in other areas. During home clearouts due to a death or during housemoves, things mostly gets binned rather than sorted for recycling or charity shops. The results are interesting! I felt that three exceptions to living green presented themselves: 1) The use of Eco-UNfriendly items which are either mandated by laws and/or company policies or convenient, 2) air travel, and 3) emotions. Let's take a closer look. Mandated and/or Convenience Items. Plastic is hard to avoid. Sometimes, we have no other choice but to use this material. For example, in my area the county mandates that recyclables be placed in a clear or blue plastic bag. Independent trash collectors require the same. Convenience items can be much easier to deal with than green alternatives. Hygiene products are especially difficult because of the "ick" factor. Reusable toilet paper, menstruation products, diapers, and handkerchiefs fall into this category. While our green ethics can be compromised in these areas, they do present us with an opportunity. Often, official policies can be changed when an individual suggests an appropriate solution. Thinking creatively can result in a method which removes the "ick" factor in using certain reusable products. Air Travel. My family lives across the country from where I live. Driving, taking a bus, or riding the train would be more environmentally friendly but it would also take more time ... time which, with work schedules, is limited. So, like many folks, I fly. 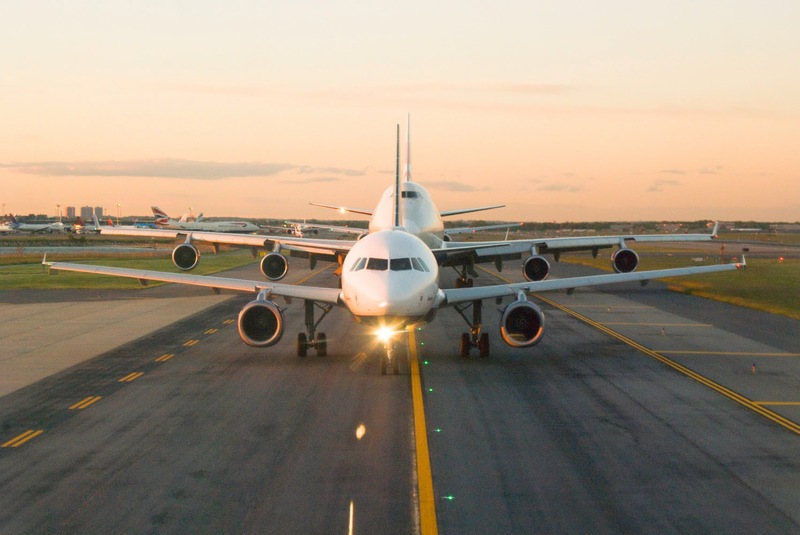 In addition to the fuel used, air travel generates a lot of waste. Refreshments are served in single-use containers, and things like pillows and earphones are wrapped in plastic. To mitigate the large Eco-footprint of air travel, patrons can buy carbon offsets ... it's not ideal but it does help. Travelers can also bring their own refreshments, pillows, and earphones. Here's a tip for bringing reusable water bottles onto a plane ... carry it empty through the security checkpoint and fill it once you're at the gate. Emotions. I had a recent conversation with a person who was having a last will & testament drawn up. The lawyer doing the paperwork suggested that nothing personal be left to beneficiaries because, in most cases, personal affects are tossed into the trash. In thinking about that, I wondered if the emotions of losing a loved one are too intense to deal with "stuff". It's often easier not to have to look at personal items. Sometimes our emotions "jade" our commitments. That little voice in our head says that it's okay to ignore or bend the rules. It might be because we're tired or upset. Or maybe it just seems like too much effort. We are, at times, our own worst enemy. Battling our emotions is both the easiest and hardest problem to solve. I find that not allowing the negative possibility to enter my head is the easiest way to battle the "devil on my shoulder". I simply refuse to think about the options and take "green" action before I can talk myself into doing otherwise. Writing down our Eco-rules can be helpful. We can remind ourselves to do the right thing during times when it would be easier to do the opposite. Talking with a friend may reinforce our ideals. They may point out that, in the time it takes to think things through, we could have taken appropriate action. If we take a serious look at the obstacles to maintaining our green living ideals, we'll see that they are, in most cases, a matter of choice. Yes, there are situations where it is impossible to be environmental ... where someone else dictates the rules. Typically, however, we simply choose to take the non-green route. Whether it's a matter of convenience, time, money, or emotions, we choose our path. And that offers us a wonderful opportunity to find ways to make the right choice. Living green may not always be the easiest route ... but it is the one which offers us the greatest benefits. When you face a tough environmental choice, how do you put green first? I am moving so there won't be a new CTWW activity this week. This week, ban plastic bags. Carry a reusable bag, use a box, or simply carry items loose. Say NO to plastic bags and don't allow them into your home. If your home is plastic bag free, please refuse to buy anything which is packaged in plastic (I know ... it's truly a challenge ... but I have confidence in you). Look around your home for plastic items and then, research non-plastic alternatives. If you are ready to replace the item, please do. If not, make plans to do so when the time comes. At the age of 41, Dee Williams nearly lost her life. After collapsing in a grocery store, she was diagnosed with a serious heart condition. While in the hospital, she witnessed a tragedy ... the death of the woman in the next bed. Those experiences reminded Ms. Williams that life is short and gave her a new appreciation for the important things in life, namely her friends, family, and home. While she loved her home, she now saw it with new eyes. She questioned the need for so many rooms and realized that they were filled with unused stuff. She thought about the cost of maintaining a large home and the time required to do so. Ultimately, she decided to downsize ... in a big way. "... I chose this path because the idea of building a house sounded like the old, fun me—the woman who thought it was a total jazz-up to hang by her thumbs fifty feet in the air, scaling some rocky crag to get a better view of the valley below. I chose this because I thought I could be happy living in a one-room house without running water or a refrigerator, and I imagined I’d learn something about myself by stripping myself down to the basics—by living with two dinner plates, three spoons, two pairs of pants, a dress, and my wool skivvies. And I figured I could be happy, at least for a while, living in the shadow of my friends Hugh and Annie’s house, in their old garden plot just off the alley. I thought I’d find something in all of this, and I got more than I bargained for. I discovered a new way of looking at the sky, the winter rain, the neighbors, and myself; and a different way of spending my time. Most important, I stumbled into a new sort of “happiness,” one that didn’t hinge on always getting what I want but rather, on wanting what I have. It’s the kind of happiness that isn’t tied so tightly to being comfortable (or having money and property), but instead is linked to a deeper sense of satisfaction—to a sense of humility and gratitude, and a better understanding of who I am in my heart. I know this sounds cheesy, and in fact, it sounds fairly similar to the gobbledygook that friends have thrown at me just after having their first baby. But the facts are the facts: I found a certain bigness in my little house—a sense of largeness, freedom, and happiness that comes when you see there’s no place else you’d rather be. ..."
When I first agreed to review this book, I thought it would be a Do-It-Yourself guide, of sorts. While it does talk about green building concepts, such as using recycled materials and minimizing waste, it speaks more to the realities of living in a very small space (84 square feet). It answers some of the questions I have about small homes. For example, where does one put (or in this case, park) a tiny house? Is it connected to water, sewer, and electricity or is it totally off the grid? The book reads as a wonderful story. I felt Ms. Williams' determination as she filled a cart with lumber and I sensed her exhilaration when she cleared an overpass on the highway. I found myself quickly turning pages to find out why she was running across a backyard in a towel and why her dog took to hiding under the house. Moreover, I understood that freeing ourselves from stuff and large spaces gives us the opportunity to experience nature in an intimate way. The Big Tiny is appropriate for everyone. Whether you're interested in downsizing, building your own home, eliminating excess stuff, or simply slowing down to appreciate life, you'll benefit from Ms. Williams' experiences. The generous folks at Blue Rider Press and Penguin Random House want to give one lucky Reduce Footprints' reader a copy of The Big Tiny. WhooHoo! This giveaway is open worldwide and will last for one week. Good Luck! 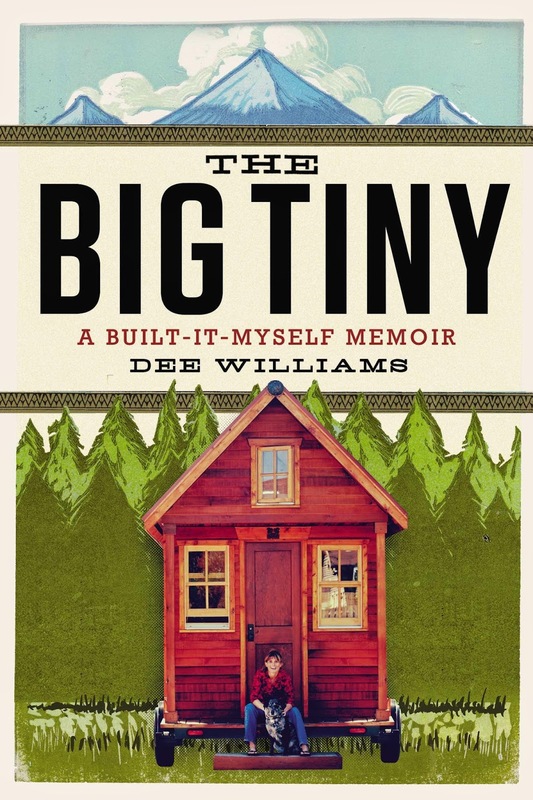 I received a copy of "The Big Tiny" in order to write this review. I received no other compensation. All opinions expressed are mine and mine alone and reflect my honest opinion of the material reviewed. Is your kitchen greener today than it was last week? Our challenge asked that we make at least one green improvement. For my part, I focused on the kitchen in my new house. We're making it as green as possible. There is, however, one area which I have resisted ... a dishwasher. I don't particularly like dishwashers and would rather not have one in my home. But research shows that the new, energy-efficient models use less water than hand washing. My electricity will be solar generated, so the energy used by the dishwasher won't be an issue. For those on the grid, I've learned that the new models use less electricity than it takes to heat the water used in hand washing. Since living green is not about my preferences but rather about what's best for the environment, I've decided to get a dishwasher. Regina kindly mentioned CTWW in this edition of The artists Daily. Alicia has achieved a lot but still has some changes which she hopes to make: "We had to buy a new fridge this past year and got a really nice energy efficient one which has made a big difference! We use cotton kitchen towels and have for about 15 years now. I can't begin to say how much money we have saved by not buying paper towels not to mention the paper not going to the landfill or hopefully trees saved! We are needing a new aerator for our sink so we will be looking into getting a good Eco Friendly one. We are also wanting to get some new dishes so it's time to start looking into which ones will work best for us. We bought a new set of stainless steel cookware recently and are thrilled with them. No more toxic Teflon!" Mary shared her ideas: "Good challenge! Switching to cloth or other reusable towels instead of paper towels is probably one of the simplest things to do! It's also possible to look at what food you have in the kitchen where you could get something organic or local to be greener and healthier. Or maybe try to use your leftovers into new dishes. For example, rotten bananas can be good for baking!" Deborah accepted the challenge and says, "Re: CTWW Greening the Kitchen Challenge: I find that the kitchen is usually the most logical room to make greener first--and it is often the easiest.In our home we 'greened' our kitchen by: Installing an efficient Berkey water filter instead of running tap water to "get out some the lead and impurities".Composting wastes. Saving orange and lemon peels to make a Citrus Vinegar Cleaner. Reusing glass jars and bottles.Using cloth rags and napkins instead of paper. Using glass containers for storage instead of plastic. Find more tips for greening the kitchen in these posts from Urban Naturale: http://urbannaturale.com/8-great-ways-to-make-your-kitchen-greener/ and http://urbannaturale.com/food-for-thought-26-eco-smart-ways-to-keep-more-food-out-of-the-trash/." Lois is a rock star. In Change the World Wednesday; Green Kitchen she talks about all the ways that she's greened up her kitchen. I am in awe! Be sure to read through the comments because she does mention one area that she's decided she could improve upon and is weighing various options. Our second rock star of the week is Argentum Vulgaris who wrote Change the World Wednesday – 9th Jul. Read through his post and see if you can find something which would make his kitchen greener ... I sure couldn't find anything. EcoGrrl found an area to concentrate on: "Our kitchen is pretty crazy green as it is, having not used paper towels or napkins for years, using antique cast iron skillets for the majority of our cooking (gotta love Griswold! ), buying our organic dry goods in bulk (we bring our actual containers to the market, no plastic bags), composting 100% of food waste, growing food in our garden or picking it locally, then preserving (my husband is harvesting our garlic today, woo hoo!). I sit here typing this looking at the echinacea my husband picked for me from our garden and put in a vase I've had for years, looking our at the growing peppers and tomatoes and onions and corn in the garden, see the energy star appliances in the kitchen, and am pretty darn happy :) But there is always room for improvement in every household!!! The dishes I bought 8 years ago from Viva Terra (great eco catalog by the way) are all chipped on the edges and so the next step is to find some dishes (sustainably made or antique store finds), and transition these ones to outdoor/picnic use. Any suggestions out there for eco-friendly dishes beyond the recycled glass ones that are super expensive?" Any suggestions for EcoGrrl? Katie has a very systematic approach to greening her kitchen. She's focusing on food storage. Read Replacing Plastic with Glass and Stainless Steel [#CTWW] to find out how she's making the switch. Green changes are often about our attitude. If we look, we can (almost always) find ways to improve. It requires our willingness to take that look and then, implement the best solution. Sometimes we allow our personal preferences to interfere with doing the right thing. It's at those moments when we have the greatest opportunity to shine ... to set aside our emotions and put the the earth first. Approximately two million single-use plastic bags are used, worldwide, each minute. According to the BBC, only 1 in 200 plastic bags in the UK are recycled. 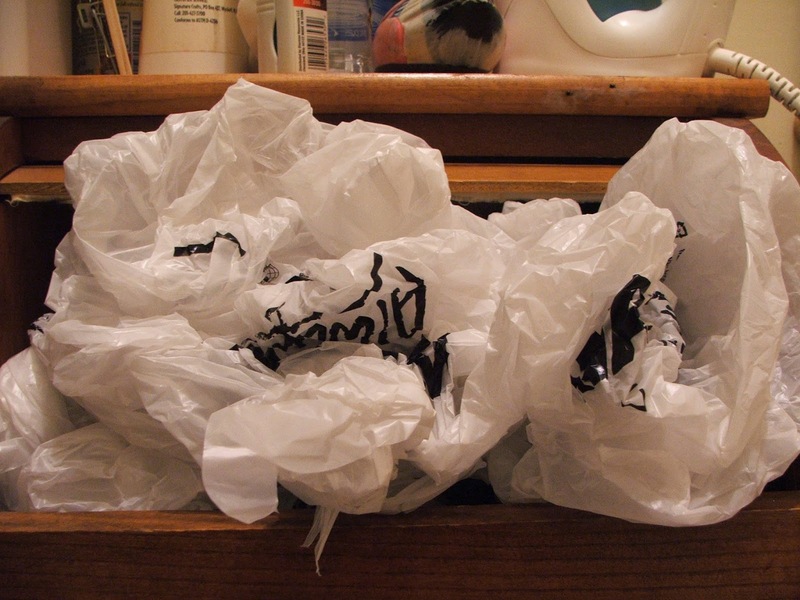 A 2011 article in Rolling Stone stated that American shoppers use more than 500 plastic bags, per consumer, per year. There are about 46,000 pieces of plastic floating in every square mile of ocean. Plastic bags remain toxic even after they break down. It costs 2-5 cents to manufacture one bag. It costs 17 cents to clean them up. Let's commit, or recommit, to banning them from our lives! July is "Plastic-Free Month". Are you ready to ban it from your life? I know that you are! Eco-friendly products are better for us! I get that! With some products, we accept the "better for us" concept on good faith. Logically we know the truth but we don't really experience the difference in a day-to-day manner. Natural body soaps have allowed me to feel the difference. I have very sensitive skin and have suffered from allergies all my life. Since switching to Eco-friendly soaps, my skin has actually gotten healthier. Rashes and skin irritations are things of the past. So, I have tangible proof that Eco-friendly body soaps are good for us! 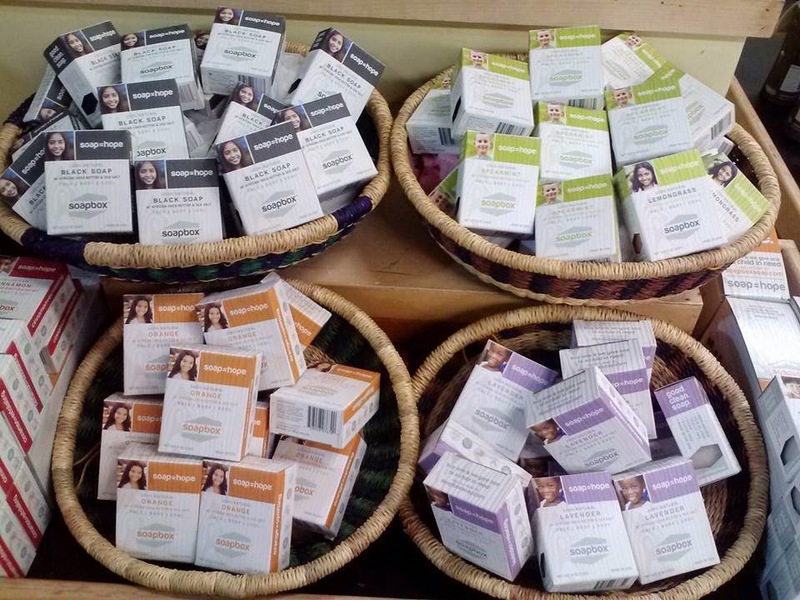 I was thrilled to receive an invitation to try products from SoapBox. Before accepting the products, I did a little research and asked some questions. 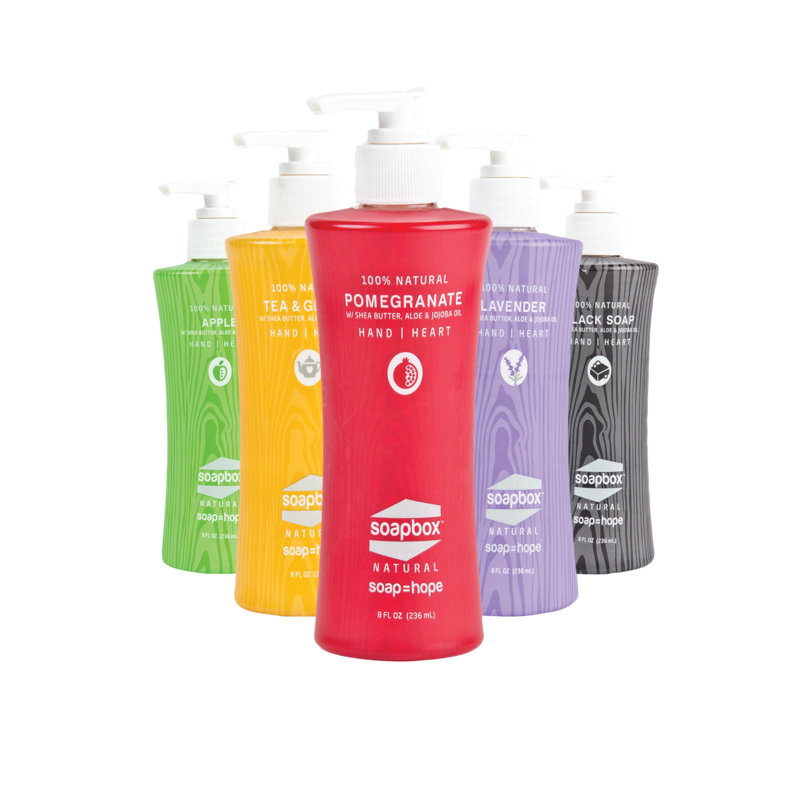 SoapBox products are made in the US using natural ingredients such as organic shea butter, aloe, and essential oils. They are cruelty free (and vegan certified), and do not contain gluten, palm oil, parabens, petrochemicals, phthalates, or sulfates. From the website, I learned that bars of soap come in Eco-friendly cardboard boxes. I was curious about the packaging for liquid soaps and learned that bottles are made of 100% recyclable plastic. The representative even gave me a link to the materials used to package samples (Xela packs). A company's philosophy is important! The people at SoapBox are dedicated to changing the world with their products ... and they invite customers to join their mission. Each purchase generates a donation to people in the US and around the world. For every bottle of liquid hand soap sold, they donate a month's supply of clean water through RainCatcher. 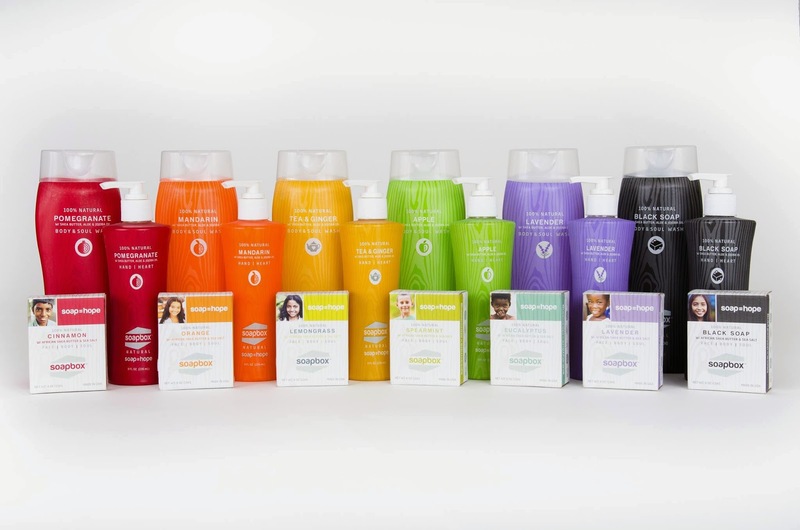 A bottle of body wash means a year's supply of vitamins through Vitamin Angels. 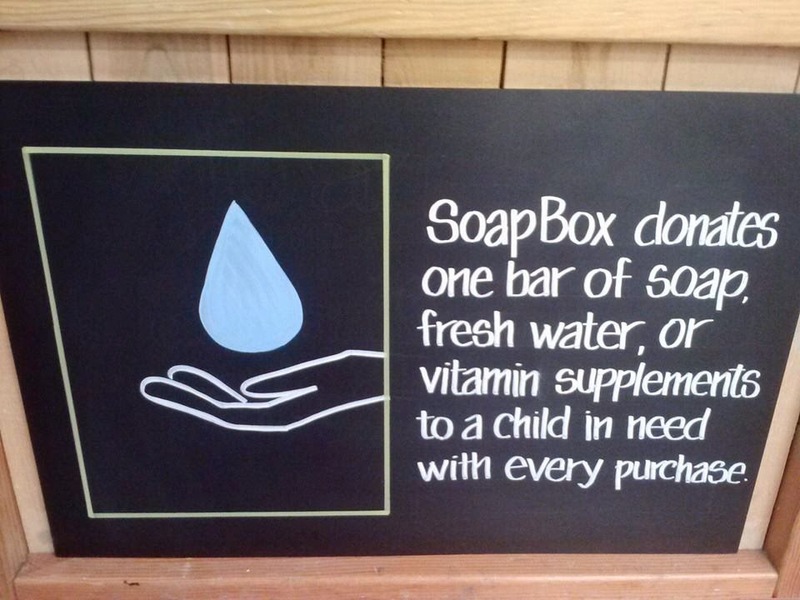 And a person in need receives a bar of soap every time SoapBox sells a bar. There is a Chinese Proverb which says, "If you give a man a fish you feed him for a day. If you teach a man to fish you feed him for a lifetime." 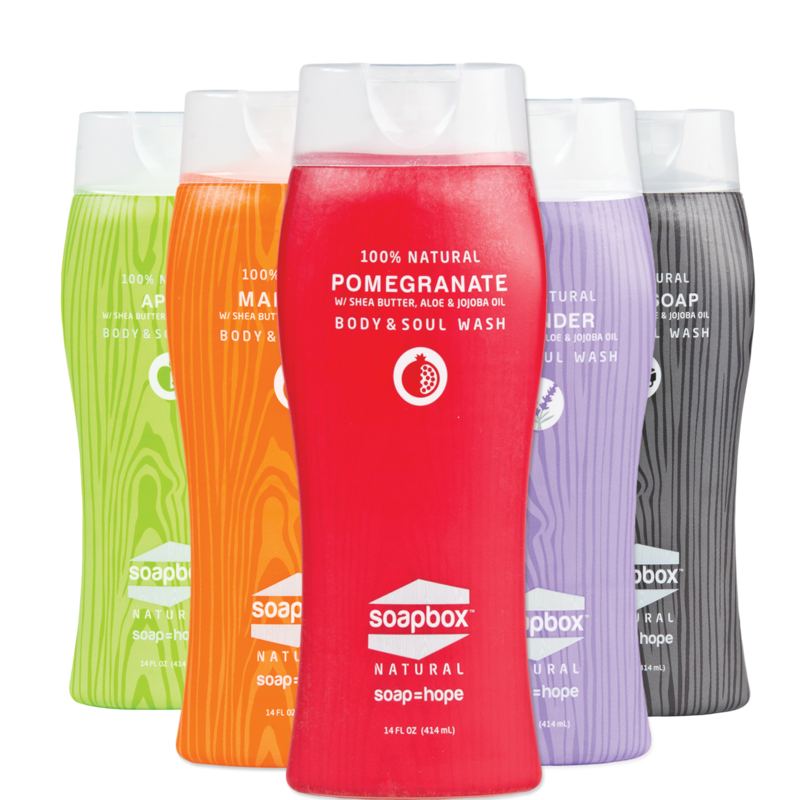 SoapBox embraces that philosophy and works with soap makers around the world to empower communities. I received a bar of eucalyptus soap, a sample of mandarin liquid hand soap, and a sample of lavender body wash. The bar soap is delightful. The scent is refreshing and pleasing, lingering slightly on the skin after use. It left my skin feeling clean and moisturized. The liquid hand soap smells wonderful ... similar to the fabulous fragrance experienced when peeling a mandarin orange. The soap lathers just a bit and washes off completely. The body wash turns a shower into a spa moment. It is silky on the skin and the scent of lavender is lovely! SoapBox gives me that tangible proof that Eco-friendly items are good for my body. They also redefine the meaning of success. It can no longer be only measured by the bottom line reported to shareholders, but rather by the amount of good a company does in the world ... for both people and the planet. In my book, SoapBox is a success! SoapBox products are now available at Target. Click HERE to see if your local store carries them. 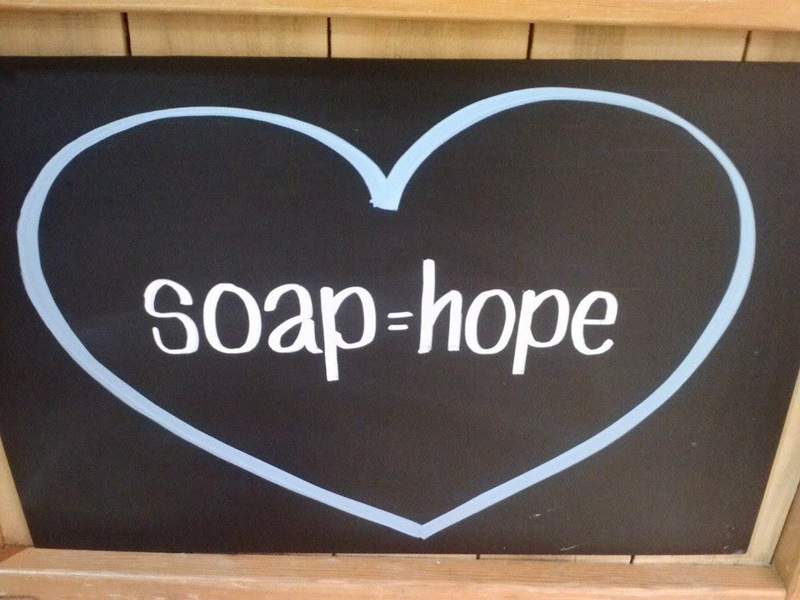 You can also purchase products from the SOAPBOX SITE. And remember, every purchase means a donation to someone in need. SoapBox has generously agreed to give one lucky Reduce Footprints' reader a gift package of their own. WhooHoo! This giveaway is open worldwide and will run for one week. There are only four, easy entry methods. Good Luck! I received SoapBox products in order to write this review. I received no other compensation. All opinions expressed are mine and mine alone and reflect my honest opinion of the material reviewed. Welcome to Meet & Greet, a regular series designed to grow our green community. 3. The link-up will remain open for a month. 4. Random.org determines the featured site each month. Random.org selected one of my favorite blogs this month ... EcoFriendlyLink written by Clare Delaney. Clare is known by her friends as a Green Goddess. She has spent most of her adult life in Africa, and says "When you live on this fascinating continent, you can’t help but realise just how much our actions affect our planet." EcoFriendlyLink is full of great content ... information which Clare has fully researched and presents in a clear, interesting way. For example, a recent post on heirloom vegetables explains the difference between heirloom, hybrid, and GMO seeds and offers reasons why heirlooms are so important. In another article, Clare shares a bit about harvesting rainwater and even mentions several rain barrels which are efficient and attractive. There are posts for every level of "greeness". Newbies can learn about Eco-friendly bags, those well on their way to living green can pick up tips on keeping their homes cool, and long-time greenies can get advice for living off the grid. EcoFriendlyLink has something for everyone. Oh ... and by the way ... want a free book entitled "Live Well, Live Green"? Check out EcoFriendlyLink's home page for your copy. Please welcome Andrea, owner of The Green Queen of Moderation. I first met Andrea via our Meet & Greet series. Her blog is full of great content! 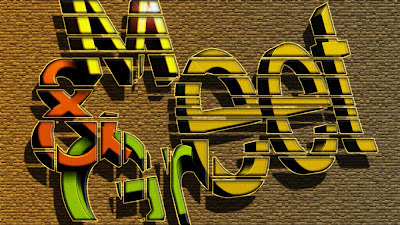 Posts are organized into four categories: The “Re” Words, The Green Garden, Green Choices, and Simple Gifts. I headed straight for the garden section and was rewarded with posts about wildflowers, pollinators, and an interesting article about plants going to seed. Each post includes stunning photos. The Simple Gifts section has terrific ideas for meaningful, earth-friendly gifts. And the "Re" Words section offers tips for recycling, repurposing, reducing, reusing, repairing, and restoring just about anything (ever thought of repurposing a top sheet into a nightgown?). Green Choices addresses all of the day-to-day decisions that we make, everything from what to cook for dinner to shopping to purging our extra stuff. In chatting with Andrea, I learned that she is converting to a vegan diet. To that end, she has been busy in the kitchen, experimenting with ingredients. She recently created a dish which both she and her husband enjoyed ... and she very graciously offered to let me post it here, for you. Please enjoy! Heat oil in a large pot over medium-high heat, add onions and garlic and cook till transparent. Add soyrizo, stirring well, and cook until heated through and soyrizo begins to brown. Add remaining ingredients (except for salt & pepper) and bring to a bubbling, boil, stirring while it cooks. Reduce heat to low, mix well, and cover—preferably with a lid that vents steam. Simmer for an hour or more. I cook on a gas stove, and use a diffuser to dissipate the heat so I don’t have to worry about the chili sticking to the pot while it simmers. Season with salt and pepper to taste. Spoon into bowls over the polenta, garnish with avocado and/or vegan yogurt and cheese. Slice and portion into chili bowls before adding chili. For those who would rather not use a microwave, polenta can be made on the stove top. Traditional polenta takes up to 45 minutes of cooking (with constant stirring) so I suggest buying quick cook varieties which typically take 3-5 minutes. Bring water and rosemary to a boil. Add the salt. Slowly pour in polenta, stirring constantly. Reduce heat and continue to simmer, stirring constantly, until polenta reaches a thick consistency (it should come away from sides of the pan, and be able to support a spoon). Turn polenta out into an oiled bowl, pie plate, or even a wooden cutting board and let cool for 10-15 minutes or until it sets (remains firm). Once the polenta has set, it's ready to be sliced and served. The original recipe, along with Andrea's reasons for going vegan, can be found HERE. If you have a vegan recipe which you'd like to share, please contact me HERE. And for all the recipes we've shared so far, be sure to visit our recipe page using the tabs at the top of this blog ... or by clicking HERE. Last week we banned single-use, disposable items. Was it a tough challenge for you? I like being outdoors ... camping, picnics, and grilling in the backyard. In my pre-green days, I used paper plates and all the usual disposable items. Frankly, it became expensive to continue buying those things, only to toss them into the trash at the end of the day. So, we invested in reusable everything. What I found is that eating off of "real" plates was much more enjoyable. They are sturdy and don't break through or leak, and clean-up isn't really that big of a deal. Reusable items make for a better experience, are cheaper in the long run, and they keep stuff out of landfills. Here's a disposable item which most won't think about: plastic picnic table cloths. In Change the World Wednesday: Single Use, Lois offers us some very creative alternatives, as well as great ideas for ditching other single-use items (I love the suggestion to ask everyone to bring their own place settings to a get-together). One post, this week, brought tears to my eyes! Which one? What single use or disposable item could YOU give up? by Mrs. Green. You'll have to read the post to find out exactly what turned on my "water works". Be sure to read the comments for interesting tips from Mrs. Green's readers. And by the way, if you haven't already pledged to reduce waste at this year's Zero Waste Week Event, please click over and do so. The event takes place in your home, wherever in the world you reside. Mrs. Green is hoping for 2,000 participants this year so ... let's help her boost the numbers. If you've already agreed to participate, please share the event with your friends, family, and readers. Alicia joined us and offered these tips: "This is a good challenge since picnic time for a lot of people usually means using lots of disposable products. We always use cloth napkins or small cotton kitchen towels instead of paper towels. We use glass storage containers to carry food to picnics and we use real plates and utensils. I love planning our meals at the first of each week. It makes a huge difference in food not being wasted. It is also nice this time of year because veggies from the gardens are starting to be harvested so no waste there. Just pick what you want to eat and freeze or can the rest!" By the way, have you seen the photos of Alicia's garden? Wowee! Click over to her blog and check out her bounty! This edition of Airings on Design gave our challenge on discovering nature a nice mention. Thanks, Peggy! There are many interesting articles in that paper including one on how to turn your home into a retreat. Mary, from Green Global Travel, joined us. She says, "Good challenge! There's always at least something that is being wasted, especially with it being summer and people having events outside. Tupperware is handy, and instead of paper towels, those reusable ones made of viscose are much better actually. Summertime is indeed a big outdoor entertaining season. If you are throwing a picnic, it would be great to purchase the chalkboard glass mason jars with straws. This way, guests can write their names on them and even take them home as a fun party favor." If you haven't visited Green Global Travel lately, please do ... I found a terrific article about a moose in Sweden. Uh Oh ... Argentum Vulgaris (AV) says "I do, however, have a confession…" Does that mean he failed on this challenge? Hop over to read Change the World Wednesday – 2nd Jul. While you're there, check out AV's Apothecary page? Tons of wonderful DIY ideas! Alaiyo, owner of Pescetarian Journal, stopped by and shared this: "I just love your challenges. Let me just say that paper towels are still a challenge, but we will not be using any paper plates or cups (we haven't for a while now)." Thanks, Alaiyo! Joanna of Every Week is Green is doing well at avoiding disposable picnic items so she took on another waste-related issue: "Thank you for including my comment and recommending my blog! This is a fantastic challenge. I am now managing to avoid many of the disposable items you mention, so this week I'm going to focus on wasting less paper. I'm okay with at home, but at work I find myself using brand new post-it notes when I know I have a lot of scrap paper at home. So I might bring some in with me and use that instead." Yay ... I hope you'll blog about your efforts, Joanna! Thanks to Lisa for a post entitled The humble handkerchief: Thinking about reusable vs. disposable items. Wow ... that's another "disposable" which I wouldn't have thought about! Thanks, Lisa! - #CTWW Because changing the world should be a daily thing! - Going to make the switch from body wash to soap to skip the bottle waste. 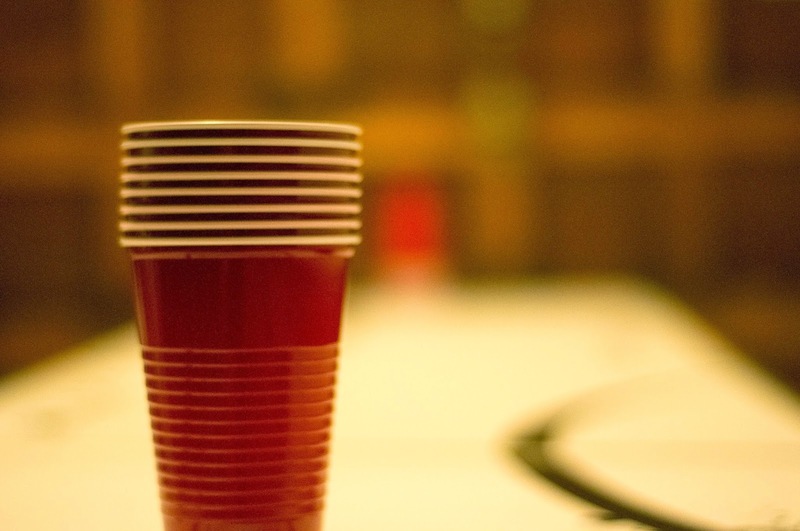 In defense of certain single-use products, such as paper plates, manufacturers will say that they are biodegradable. It's true ... some disposable items will biodegrade. However, the degradation process creates CO2 which contributes to global warming. In the natural world, biodegradation isn't a problem ... organic matter decomposes, creating CO2, which trees and plants absorb. But using disposable products overwhelms the system. Simply put, it adds to climate change, which is already at critical levels. Thinking about convenience items in that light shows that they are a very expensive way to save ourselves a few minutes of washing up time. It hardly seems worth it! important room in the house? Have you ever noticed how everyone seems to gravitate to the kitchen? It is probably one of the most used areas in our home. So, let's view our kitchens with new eyes! This week, go into your kitchen and look for at least one way to make it greener. You might choose to do something simple like add an aerator to the faucet, convert to cloth towels instead of paper, replace a light bulb with a CFL or LED, or unplug an appliance (especially those with clocks). Maybe you are in the market for new cookware, dishes, etc. and could look for green options. Does your kitchen need paint? Perhaps you grab a brush and use non-VOC colors. You might even be considering a kitchen remodel and could search out the most appropriate Eco-friendly cabinets, counter tops, flooring, etc. The idea, this week, is to look around your kitchen and make a green improvement. Are you ready to tackle the kitchen? I know that you are! Over the holiday weekend, I heard someone say that because it was a holiday, they could relax their rules. I got to thinking about green living and wondered if there were ever a time, or situation, when you would put the environment aside? 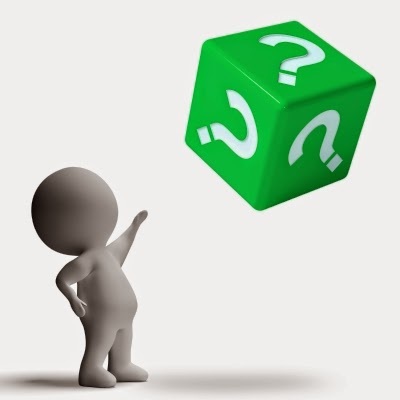 Is it always your foremost consideration or are there circumstances in which you'd bend your environmental rules? If you are reading this post via email, please use the following link to access the survey: https://www.surveymonkey.com/s/L9JFS9M. Join us on July 28th for the interesting results! I have a real treat for you today! Sophie Uliano, NY Times bestselling author of Gorgeously Green series of books, including 8 Simple Steps To An Earth-Friendly Life and the forthcoming Do It Gorgeously (2015), is on a mission to make life easier for us. For more information, including recipes, videos, and product reviews, visit SOPHIE ULIANO'S WEBSITE. To purchase any of her books, visit her PAGE ON AMAZON. Last week's challenge was a fun one ... we headed outside and spent some time with nature. I loved hearing about all the ways others got cozy with the natural world. I've always enjoyed being outside, listening to creature sounds, watching their interactions with us and each other, and learning about plants. It reminds me how closely we are related to all things on earth ... we breathe the same air, drink the same water ... it's a beautiful thing! Here's how EcoGrrl did this week: "My husband and I make it a habit to walk out into our garden as soon as we get out of bed in the morning and enjoy the stillness in the air and absorb our garden's beauty. It always helps me breathe better to just pad around out there barefoot in the early mornings and around dusk when I'm harvesting food from it. You might like this link, it came from my yoga teacher this morning about mindfulness and reminds me of why getting quiet time in nature is so important: http://www.buddhist-canon.com/PUBLIC/XIUZHENG/eat.htm "
In Change the World Wednesday – 25th Jun, Argentum Vulgaris reveals how not having a smartphone helps him to notice the natural world. He also shares an added bonus of spending time outside ... de-stressing. Be sure to take a look at the graphic towards the bottom of the post ... it says it all! Airings on Design gave CTWW a nice, headline spot. The rest of that edition includes some great articles on home design. If you're thinking of changing the look and feel of your home, check it out ... there are some interesting ideas. Welcome to Joanna, who joins us this week. She shares this: "I do a fair amount of walking but don't often take the opportunity to just amble along and enjoy nature. I'll take a wander through my local park this weekend, without headphones. Nature walks always make me feel calmer, so this is something I should do more often!" By the way, if you haven't checked out Joanna's blog, please do so ... she's on a journey to live greener and shares some wonderful thoughts and ideas with readers. Her approach is fresh and interesting. So stop by ... and say hello! Vanessa joined us. She left this comment: "That's a great idea to try to change the world with one challenge at a time! I'll take yours to heart because I've been caught up in work and haven't been able to go outside and enjoy a peaceful morning with birds. Thanks for the reminder!" Alicia didn't have any trouble accepting this challenge. Here are her comments: "My husband and I also go out in the early morning and check our garden. For the past several weeks I have been taking a good walk every morning before it starts to get hot. I have really been enjoying all the beautiful flowers that I have been seeing. Some of our neighbors have horses and some have cows and I love seeing them out in the pastures.I also spot a lot of different species of birds, lots of squirrels and some rabbits. Walks can be so peaceful and it is so nice to enjoy all of these wonderful things the Lord has put here for us." Lois stopped by and shared this: "Now that winter is over, the last thing I want to do is be stuck indoors. I am outside the majority of the day even taking meals out in the field. My furniture projects get dragged outside where I work on them surrounded by bird song and visits by my other wild neighbors." Clare accepted the challenge and offered us this: " It's so lovely to read the comments on this blog - I think you've built up a wonderful community of like-minded people who truly love being outdoors! I go and feed the birds first thing and then sit and watch them and enjoy the peace of my garden before the heat and the madness of the day! You could combine your time outdoors with another activity, which will keep you in even closer touch with nature - read about it here: http://www.ecofriendlylink.com/blog/forageforfood. and of course if you're appreciating nature, you'll probably want some Zen too - quick read here: http://www.ecofriendlylink.com/blog/zensavetheworld. Thanks Small for a most pleasurable CTWW task this week!" Deborah joined in the fun and shared this: "Re: Change The World Wednesday (#CTWW) - Discovering Nature When it comes to nature, the best things in life are free! Spending time outside in the fresh air and natural environment really lifts me. And it doesn't have to cost a dime. Whether walking, running, biking, hiking or swimming, being out in nature is one of the best remedies for the "blues". I also talked about the therapeutic benefits of spending time among trees on my blog in the following post: http://urbannaturale.com/now-i-know-why-i-feel-calmer-around-trees-british-study-confirms-it/. I am so glad you shared this thought-provoking post at the Healthy Happy Green and Natural Party Blog Hop! I appreciate it!" LadyJC accepted our challenge. She said: "I took a nature moment this week when I sat down under the pine tree in the backyard and looked up at the branches. The tree is magnificent and very tall, although a few branches short from the Winter storms. It's quite meditative and I could tell my dog was enjoying the quiet moment too because she sat on my lap and fell asleep! :) Here's a photo of it if you'd like to take a glimpse as well http://buff.ly/1iRSHHz. My more active commune with nature came in the form of foraging for mulberries. It was my first experience foraging in the city and I really enjoyed it. http://buff.ly/1iRTdoO Thank you so much for this challenge. Aside from my regular yard work I will try to add a calm moment with nature several times a week. It makes a huge difference, especially living in the big city! Off to read Clare's entry about foraging for food!" There are so many benefits to spending time in nature. On a personal level, it helps us to relax and relieve the stress of our busy lives. On a global level, it gives us an appreciation for the world which we live in. We tend to protect what we love. And getting to know the world around us is one way to develop love. 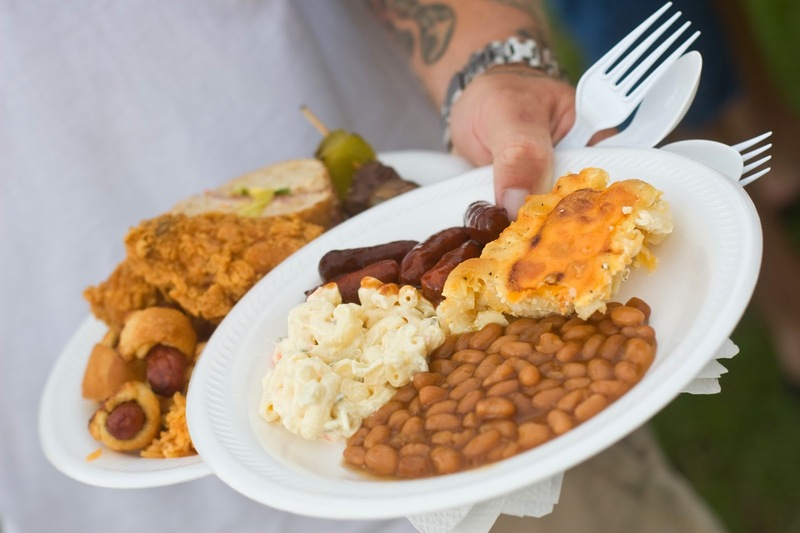 During this time of year, many people enjoy picnics, outdoor parties, and camping trips. Unfortunately, those activities typically generate a lot of waste. While disposable items are convenient when we are away from home, they are a big problem for the environment! This week, avoid the use of any single-use or disposable items. This includes paper towels, paper plates & cups, plastic utensils, plastic water bottles, aluminum cooking trays, etc. Instead, make the effort to use real plates, towels, etc. The idea is to eliminate waste. If you've already eliminated ALL single-use and disposable items, please reduce other waste. For example, plan meals this week so that no food is wasted. Before tossing an item out, try reusing it or offer it on Freecycle. The goal is to achieve zero waste this week. Mrs. Green has revealed the theme of this year's National Zero Waste week 2014, which begins on September 1, 2014. Head over, check it out, and then join in the fun. Don't wait until September, though ... there will be tons of great zero waste tips and ideas between now and the actual event (some you might be able to use this week). Are you up for reducing eliminating waste this week? I know that you are! Want an easy way to keep up with our challenges? copying the code & pasting it into your site!